The design for this one is taken from an old sketch of mine, some of you may remember. Modified to biometals taste and cleaned up, it came out well. Contact designs are not for personal or commercial use, no derivative works please. NICE "NEW" version of the USAF A-10 'WARTHOG". Have you ever seen a A-10 for real.? I did I was in the USAF, I worked around them all the time. the GUN is a "30MM" gattling gun. Next time you go to a hardware store look at a 30mm socket,that's how big the round is.Actually its about 9 inches long,round and casing included. it can eat thru a tank like a hot knife thru butter. Your picture would be nice if that was the NEW A-10 though, it does look meaner. Reminds me of the "New" Imperial Navy Lightning, but much nicer. That and I preferred the old design more. Full Thumbs up to you on this! The Army APACHE helicopters have a 30mm gun on them too, the MARINES have a landing craft with one also. and the USAF has a AC-130 with on on it too. The AC-130 is a FLYING TANK, check it out when you have time. that's correct, I worked around A-10's in the USAF. I know about the AC-130 and it is basically a flying Artillery platform for CAS operations. A-10 III doesn't look like that. That is close to the LEGO futuristic A-10. That plane looks like it eats tanks for breakfast! I am not going to say what it obviously looks like. I will say that I would love to see somebody build this for real. Like a RC model or something. 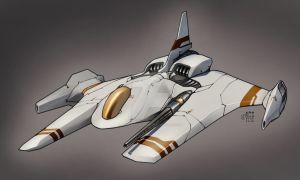 If this could fly, I would pay good money for one. Awesome work! The design of the engines look like this could be used for VTOL flight. I gotta say though...this looks like one heavy beast. it is,I worked next to the in the USAF. Is that from batalian wars 2 i think? Its a game. Its not from Battalion Wars, but I enjoy the fact that someone remembers that awesome game. just about to type that! Swift and deadly, a nice set of features for anything offering air support. The "traditional" look is very cool. Well done. The A-10 itself sacrifices Speed for firepower, stability and lower stall speeds. It is actually remarkably maneuverable however. It's scifi, so I don't pay too much attention to practicalities. Looks like the natural evolution of the A-10. That was just my personal opinion.